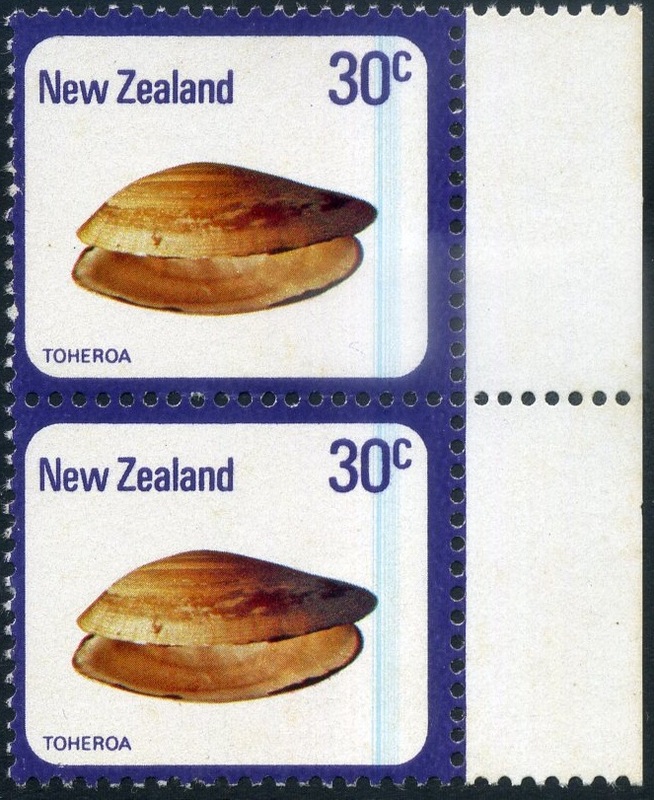 Virtual New Zealand Stamps: 1975 Definitives / Pictorials - Part Five. 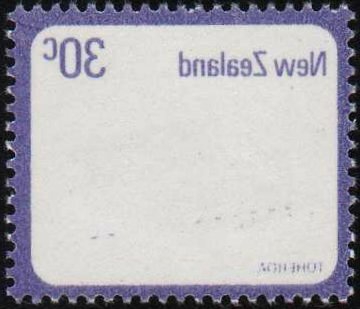 Errors in the Higher Values. 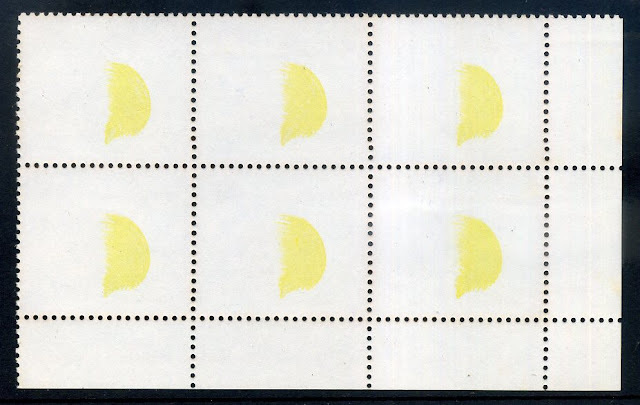 Finally we come to flaws and errors found in the higher values. 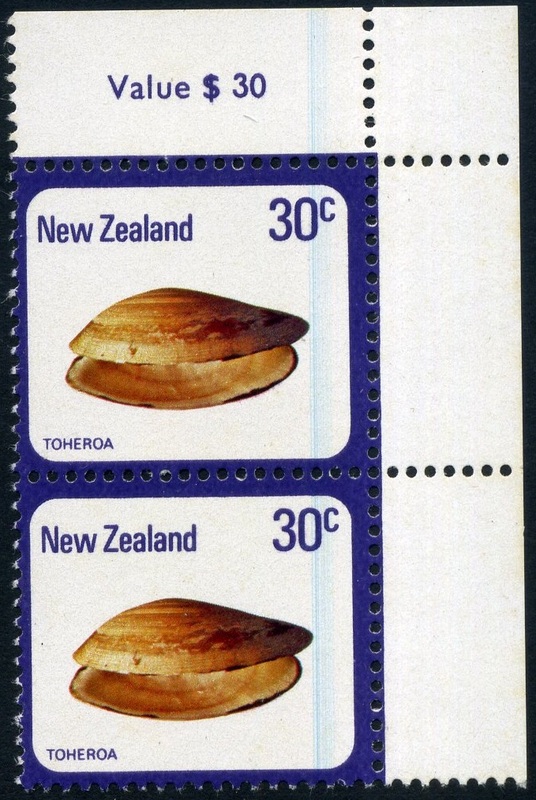 I struggled to find a good variety of flaws in these stamps. 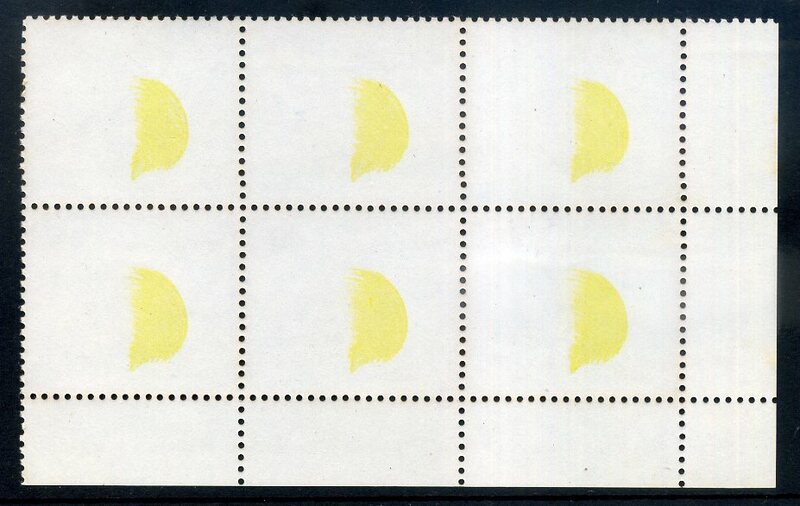 So this page seems to show a lot more stamps offset on their back than I would have liked. 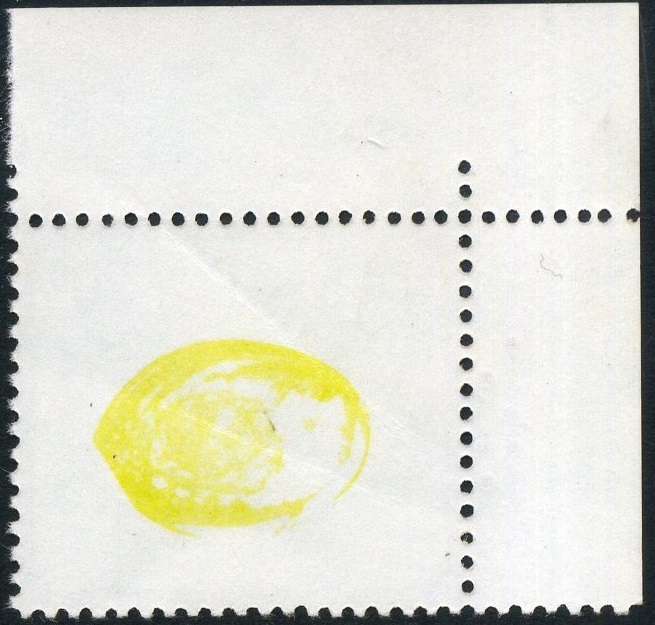 I will continue to look for more and include when I can. 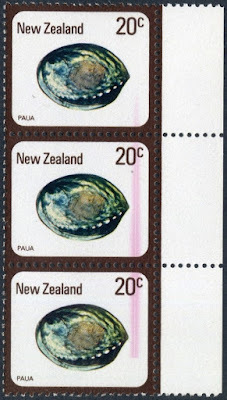 Left-hand Stamp - 1978 20c Paua Shell selvage strip of 3 with red vertical Doctor Blade flaw which affects all 3 stamps. 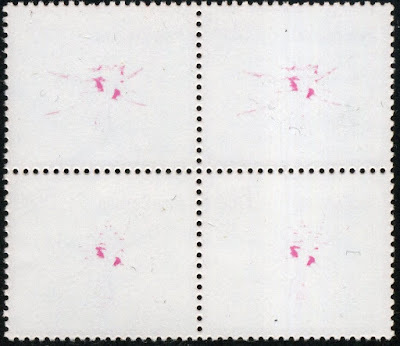 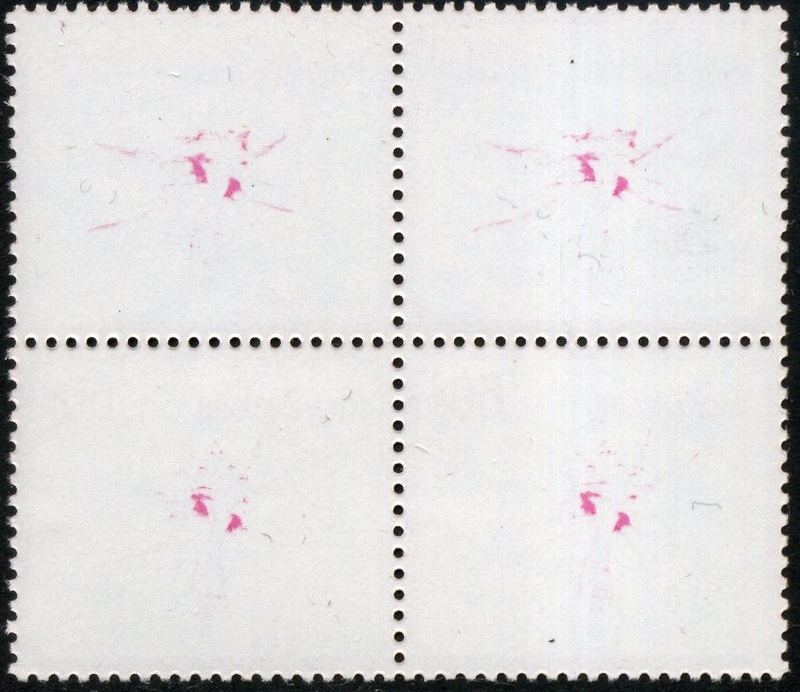 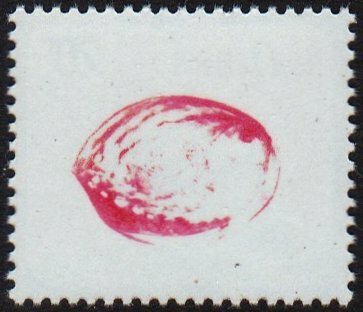 Right-hand Stamp - 1978 20c Paua Used Selvage Blk4 with minor red shift, magenta keyline around lower right shell edge. 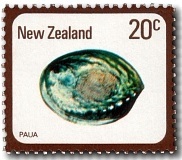 Left-hand stamp - 1978 20c Paua Shell with red colour offset on back. 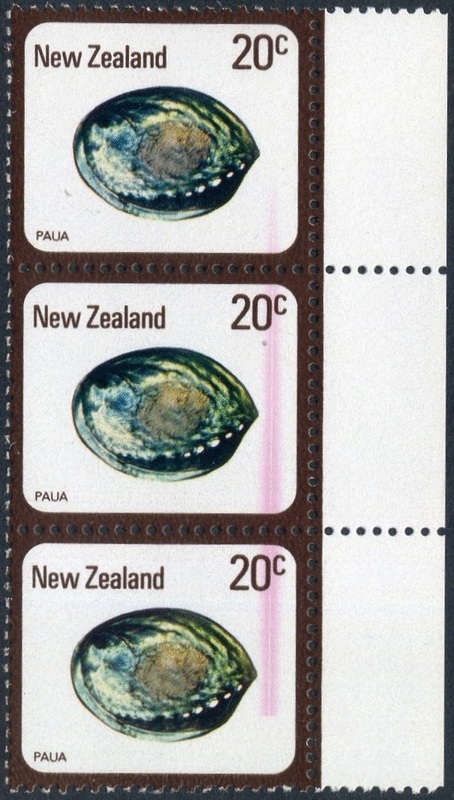 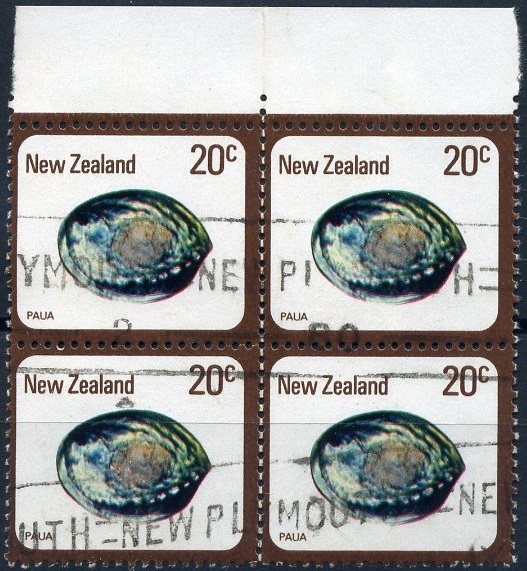 Right-hand stamp - 1978 20c Paua Shell with chestnut & yellow offset on back. 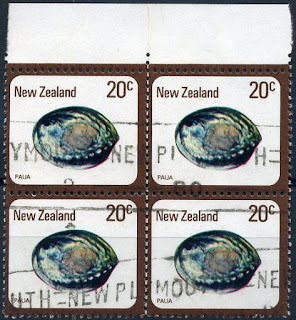 1978 20c Paua Shell with yellow colour 100% offset on back. 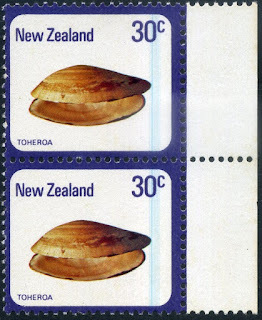 Above & below - 1978 30c Toheroa with Doctor Blade flaw in blue vertically down each stamp. 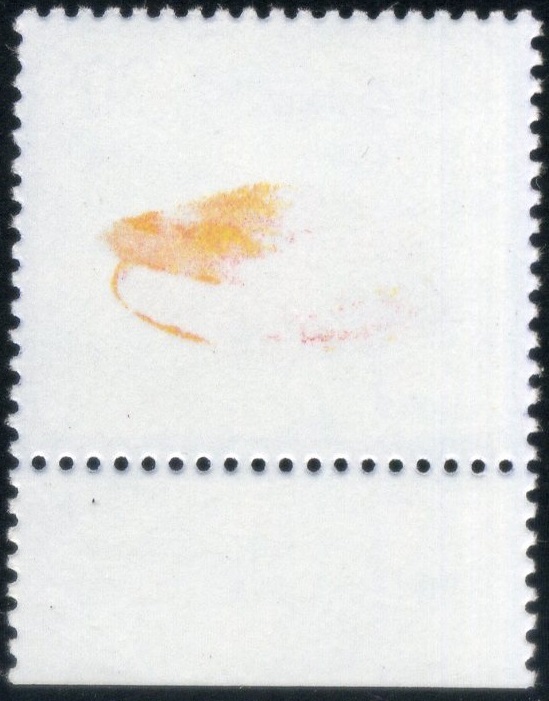 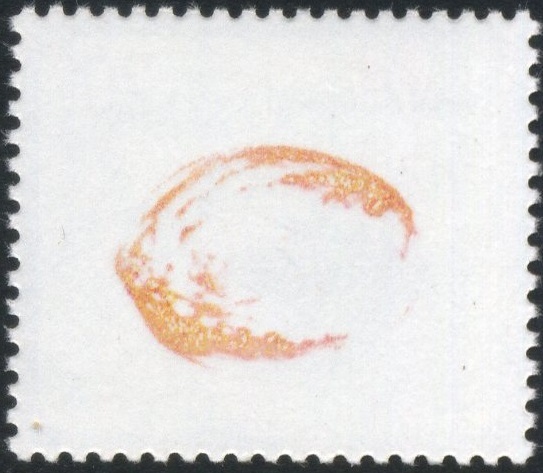 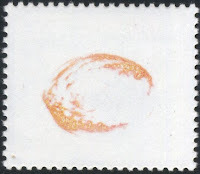 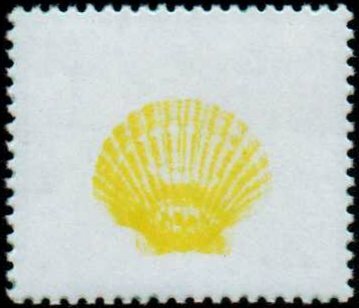 Left-hand stamp - 1978 30c Toheroa Shell with yellow/orange offset on back. 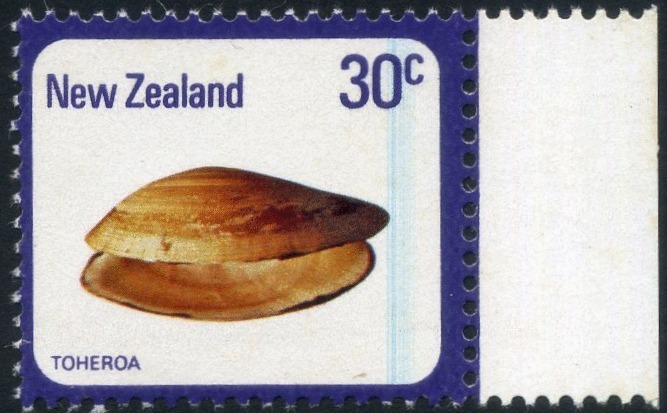 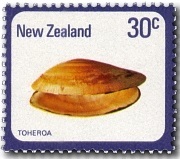 Right-hand stamp - 1978 30c Toheroa Shell with violet colour offset on back. 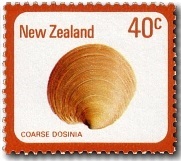 40c - Coarse Dosinia Shell. 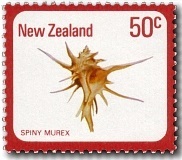 50c - Spiny Murex Shell. 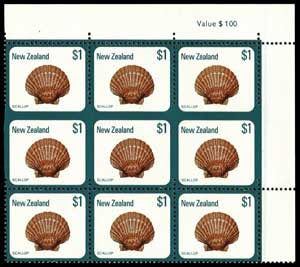 1978 50c Spiny Murex Shell block of 4 with red offset on the back. 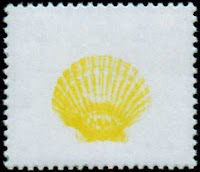 1979 $1 Scallop yellow colour offset on back. 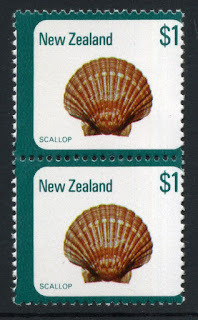 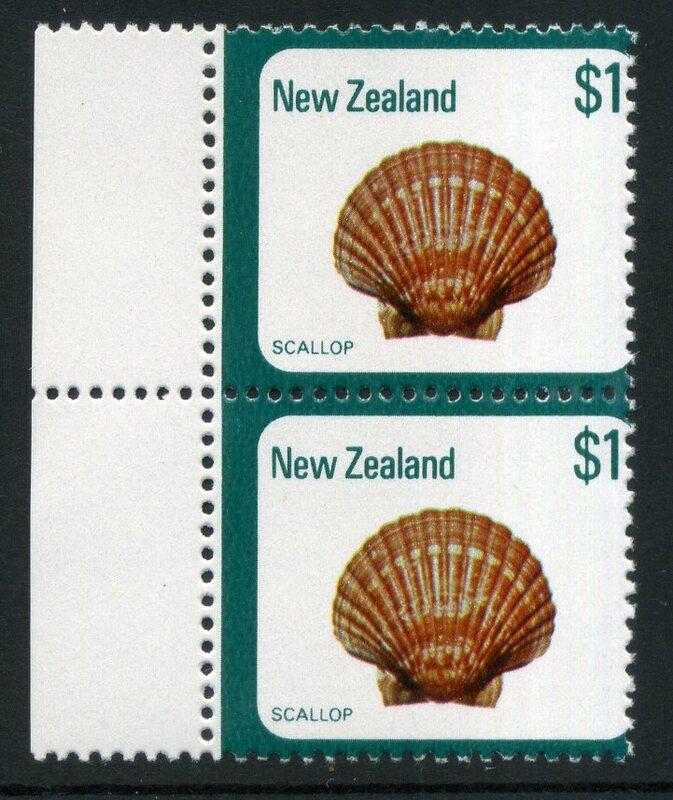 1979 $1.00 Scallop Shell pairs with perforation shift, no frame down right-hand side. 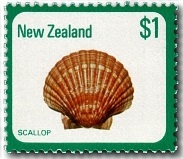 1979 $1.00 Scallop Shell with perforation partly missing. 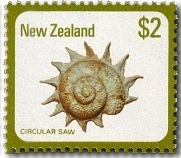 $2 - Circular Saw Shell. 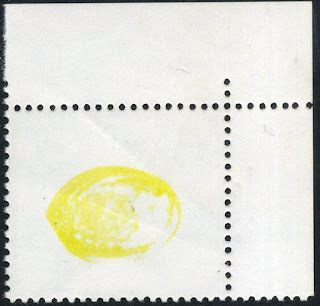 I have not found any errors for this stamp.